Great Bay Express - View timetables, Compare and book ferry tickets at directferries.ie. 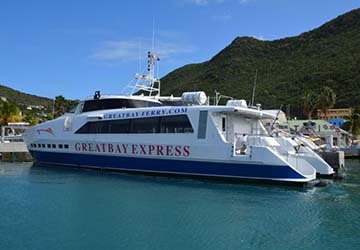 Great Bay Express is one of the newest ferry operators to provide fast crossings between the islands of Saint Maarten and Saint Barthelemy in the Caribbean Lesser Antilles. The company was founded by Bobby Velasquez, a local sailor with years of experience in the yachting and maritime industry. His aim was to offer both locals and tourists with a fast, reliable and safe mode of transport between these two beautiful islands. With a convenient timetable and excellent customer service, Great Bay Express are fast becoming one of the region’s most popular ferry companies. Within 45 minutes, passengers can jump from St Maarten’s stunning beaches to the boutique cafes and designer shops on St Barthelemy in comfort and style. 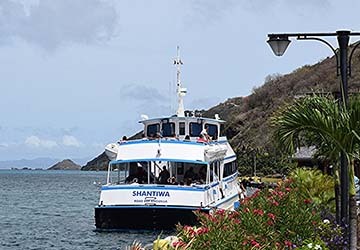 The main vessel, named ‘Shantiwa’, has a 65-inch mono-hull purpose-built for cruising on the Caribbean Sea, which means you’re guaranteed a smooth journey whatever the weather. The ferry features 2 outdoor decks, indoor seating and air-conditioning, with a capacity of 130 seated passengers. Great Bay Express also offers a free bus and taxi service to and from the airports on St Maarten. Direct Ferries provides a ferry timetable and price comparison, based on your search criteria, allowing you to compare Great Bay Express products with multiple ferry company timetables and fares in one search. Compare Great Bay Express timetables and prices now with all alternative ferry operators before booking your ferry ticket to ensure you get the best option for your ferry trip.